After all, Noah was the team’s leader as the Bulls put together the best record in the Eastern Conference since the New Year. “Joakim is many things for our team and he has proven to be a terrific competitor, leader and teammate. But what Joakim truly is, is a winner,” said Bulls GM Gar Forman. However, when asked about how he felt about it and the national attention that came with it, Noah grew uncomfortable. He didn’t like it and he said as much. On Monday, Noah got his due, becoming the second Bulls player in franchise history to claim the 2013-14 Kia NBA Defensive Player of the Year Award. Michael Jordan won the award in 1987-88. As part of its support of the Defensive Player of the Year Award, Regional Sales Manager Nathan Rachow shared that Kia Motors America will donate an all-new 2015 Kia Sorento LX CUV to a charity of Noah’s choice. And while it is very much an individual accolade, Noah insisted it is a team accomplishment. Several members of the Bulls organization, including President and Chief Operating Officer Michael Reinsdorf and Executive Vice President of Basketball Operations John Paxson, were also on hand in support of Noah. Noah credited his father for his work ethic and half-jokingly apologized to his mother for the occasional hard time he put her through while growing up as a teenager in New York City. Noah then cut to the chase of what the award really means to him. 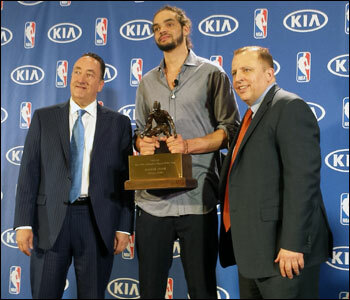 “This award is a team award,” said Noah, the two-time NBA All-Star. Noah beamed with pride as he talked about his teammates and how they’ve come together so many times in the face of adversity. He then turned to Bulls coach Tom Thibodeau. Noah said he was humbled by the award and after an emotional week in which he lost a former coach and mentor, someone who he likened to a second father, it was the late Tyrone Green to whom Noah dedicated the award. As for the award itself, Noah claimed it in runaway fashion, collecting 555 out of a possible 1,125 points and 100 out of a possible 125 first-place votes. Roy Hibbert (166 points, eight first-place votes) finished second. Bulls general manager Gar Forman was also on hand, recalling the first time he saw Noah, who helped Chicago hold opponents to a league-low 91.8 points per game this season, play in person. He was still at Florida, where he won back-to-back national championships, and right away it was Noah’s “ultra-competitive” spirit that jumped out at him. And while words like passion and energy come to mind when talking about Noah and his style of play, Forman opted for just one word to sum him up: Winner. “When we hit tough times, there’s nobody you want in the trenches more,” said Forman. Thibodeau, meanwhile, cited Noah’s relentless work ethic, the way he sets the tone, and how because of those things the best is yet to come. Thibodeau believes Noah has improved in a number of areas during his professional career with passing and defense coming to the forefront this season. But Thibodeau also lauded Noah for coming along offensively with his scoring, along with his leadership, professionalism and never say die attitude.